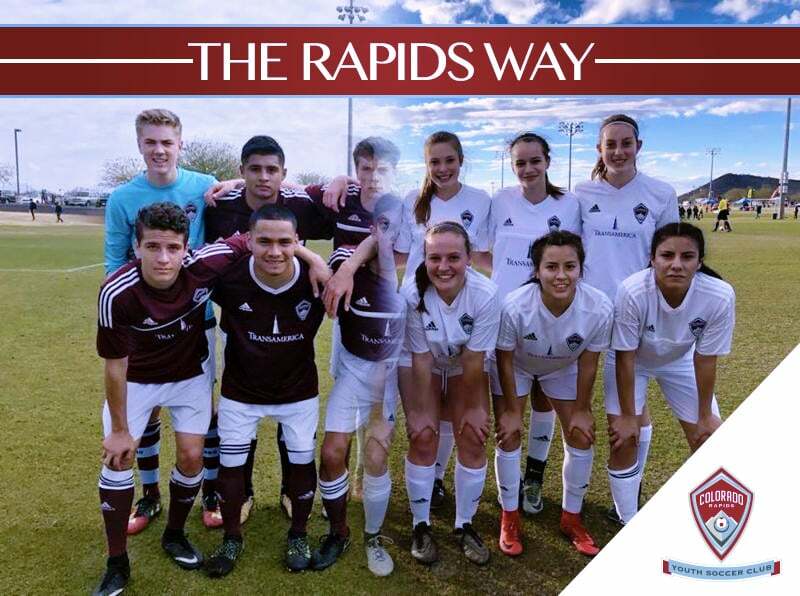 This year has already seen tournaments throughout the nation with coaches using these trips to help our players better understand the Rapids Youth Soccer core values. Coaches have been hosting club culture nights where players from different age groups and teams gather to highlight the importance of a united vision and how Rapids Youth Soccer is more than just a collection of teams wearing the same crest. Building on these foundations, the Club has been working towards an atmosphere of unity. From coaches and players to parent volunteers, we are building a #OneClub mentality. With players moving between various levels of competition within the club, it is crucial now more than ever to create a culture of inclusion and excellence. These expectations are the building blocks of an environment that rewards hard work and promotes growth at the individual, group, and organizational levels. Presentations started by showing and explaining the Rapids Youth Soccer core values. Teams presented their ideas and a general discussion followed to better clarify concepts and their application. Videos were shown to give examples of how professionals embody these core values. It is important for young players to know and see that character and leadership are not abstract concepts but quantifiable commitments that are made on a daily basis. Players worked in teams to find soccer specific examples where excellence, passion, and character were shown. From here coaches highlighted Rapids teams and players who had showcased these traits throughout the tournament and preseason training. Coaches pushed players to think about their “why.” Understanding each players motivation and setting clear, quantifiable goals are crucial in reaching their destination. Many players take strides toward goals intrinsically, but how much more could we achieve together if we clearly defined our destination and its steps? Moments of adversity often push us to question our motivation and assess whether the cost is worth it. To push oneself out of our comfort zone and stay there, we must understand what is driving us. Motivation can be fleeting when the going gets tough but with a strong sense of purpose even the most difficult objectives can be broken down into small building blocks. The start will be tough for anyone trying to create new habits but with time and effort it will become second nature. The Rapids Way embodies everything we are and stand for as a soccer club. The Rapids Way is much more than just what we do and how we do it. It encompasses who we are as a Club, from how we handle our administrative details to how coaches instruct players in training to how our players and families conduct themselves on and off the field. The Club’s mission and vision shape a philosophy, methodology, and culture that provide a framework for us to work in these key areas.